The security patches are now available to all Windows customers over Windows Update, and "No other security updates are scheduled for release until the next scheduled monthly update release on March 14, 2017," Microsoft says. The flaws are rated "Critical" for Windows client operating systems to Windows 8.1 and Windows Server 2016, but "Moderate" for Windows Server 2012. The other one is the flaw disclosed by Google earlier this week that affects Microsoft's Windows operating systems ranging from Windows Vista Service Pack 2 to the latest Windows 10 that had yet to be patched. Google disclosed the vulnerability, which resides in Windows' Graphics Device Interface (GDI) library, with POC exploit, meaning attackers can exploit the vulnerability before Microsoft issue a patch. 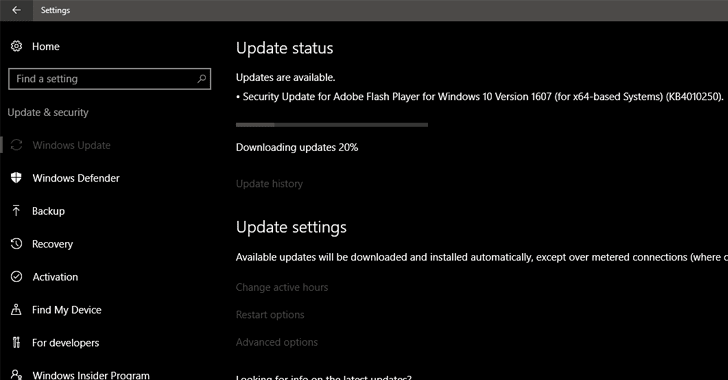 The latest security patches come a week after Microsoft's usual Patch Tuesday. So if you check for updates on your Windows PC and find one waiting for you, don't be surprised and patch your software immediately to make sure your Flash Player software is secure, though you’ll still be waiting until March 14 for the complete Patch Tuesday fix.